TripBarker - Trip Planning, Traffic, Weather and More! Trip Barker is a trip planning web service designed for mass transit commuters. With the help of its growing community of users, Trip Barker provides weather, traffic, events and points of interest information along with the best trip route for your daily commute. Currently available for Metro Manila, a megalopolis of 11 million people, Trip Barker will soon be available in other major cities. 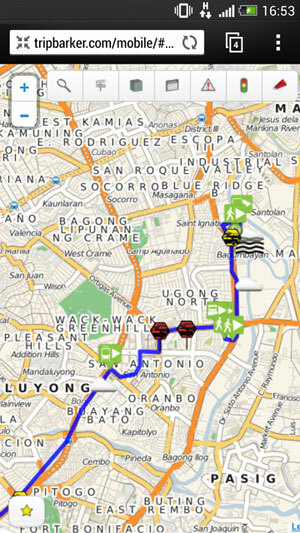 Click on “Routes” to find different route options for you to choose from. Click on “Directions” to get the step by step guide for your trip along with an estimate on how much the trip will cost. Traffic Reports - Once you have a transit route plotted, Trip Barker will provide you real-time traffic reports to let you know of how much traffic there is along your planned route. Moderate to Heavy traffic areas will automatically appear on the map, while clicking the “Incidents” and “Traffic” tabs will list down a summary of traffic-related events along your route. Traffic data for Metro Manila is provided via the MMDA traffic website as well from user-contributed traffic information. Events – Trip Barker has partnered with Giegz.com in providing the latest events, sales, concerts and more to Trip Barker users. Just click the Events tab and choose the type of event you’re interested in and Trip Barker will plot it in your map! Once logged in, the trip planner now defaults to your current location as detected via GSM/Wifi Triangulation or via GPS. If you are a registered Trip Barker user, you now have the ability to report incidents, traffic, and weather conditions from your current position. You are also able to create a new point of interest (i.e. your favorite coffee shop) or promote an event you’ll be attending. These reports are then shared to ALL other Trip Barker visitors! Trip Barker Achievements and Points – Earn achievements and points by using Trip Barker regularly and by helping us provide provide real-time data on Traffic, Weather, and Points of Interest and Events across the Metro. Earning more points will allow you to unlock special avatars and achievements that will acknowledge your valuable contributions to the Trip Barker Community. Trip Barker for Android - Get even more features such as Trip Logging by downloading the Android App. While keeping track of your daily trips you also help improve the Trip Barker system for other users! Low Bandwidth Trip Planner – Ideal for feature phone users or for places with poor data connections, the low bandwidth trip planner provides the same, powerful trip planning functionality offered by the desktop and smartphone version in a no-frills environment. SMS Based Trip Planner – By registering your mobile phone with trip barker, we provide you access to out SMS based trip planner. Just text your planned trip to +63 943 453 5904 and Trip Barker will text back a recommended trip route for you. Trip Barker Reports – The trip barker reports provides summary information of the activities in Trip Barker. It is designed to give researchers and decision makers information on commuter behavior as well as provide a snap shot of what is going on around the metropolis in real-time. Trip Barker API – Create your own apps using Trip Barker data by accessing our API. For FREE access to the api, kindly email info@tripbarker.com for more information. TripBarker.com is proudly brought to you by EACOMM Corporation.